My absence here isn’t because I’ve been too busy writing this time, but I honestly wish it were. As much as I hate neglecting my blog and readers, I wanted so bad to tell you it was due to work. Unfortunately, though, that’s not the reason this time. In all my 10 + years as a writer, I can’t recall a time when I’ve been so lost for words. I don’t know why words have been such a terrible struggle for me these past few months, but I plan to cure it by tonight. Each time that I’ve sat down at my computer to write these past few months, I was at a loss for words. No matter what, the words just wouldn’t flow. I became so irritated that I gave up and headed for bed. Moments after I sat on the side of my bed all kinds of ideas and words — yes, words that I was at a loss for — gushed through my head! “Okay. Great!” I thought. “That’s exactly what I wanted to happen minutes earlier,” I told myself as I got back up and headed to my computer to put those words on screen and save them. Nevertheless, as soon as I sat back down in front of the computer, I wanted to scream. Everything that had come to me vanished! Back to bed again, and just like before, the ideas and words returned. This time I didn’t rush to the computer, though. I knew if I sat back down in front of my computer the cycle would continue. Instead, I grabbed a flashlight, along with pen and paper, which I keep on my bedside table, and I wrote everything that had come flooding back down by hand. I don’t know why, but for some odd reason I think better in the dark, and I write better with pen and paper under little light. Maybe it’s because when I first started writing that’s how I did things. Even when mom bought me a typewriter, I still wrote everything longhand then typed it later. 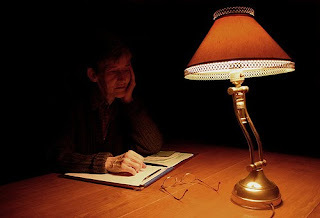 As for thinking better in the dark, I can’t write unless it’s silent, so when I’m sitting in the dark, it’s peaceful. Well, except for the humming of the appliances and hubby snoring, and if that starts to interrupt my thoughts, I put in earplugs. Finally, I believe I discovered the cure for my struggle with words, so tonight my plan is to sit in the dark, where it’s quiet, with only little light to see by, and during that time, I’ll write my words by hand and type them into the computer later. I know this will work, because that’s exactly how I wrote this post that you’re reading now. If you ever find yourself struggling with words, do what usually works best for you. Many times it’s the simple things that we use to do that works best, so instead of neglecting your work and your readers, stick with the thing that works best for you. If you’re still reading my blog, thanks for sticking around and being patient with me during my absence. Now that I think I’ve uncovered the solution to my problem, I hope to start blogging frequently again. May the Lord bless you with an abundance of words and solutions to any problems you may be struggling with. And last but certainly not least, I wish you and yours a very Merry Christmas and blessed New Year! I'm glad you've found a solution. May the Lord richly bless you and your family at Christmastime and throughout the coming year.